Design patterns: factory » Hello World! But your clients expect from you to add more different kinds of pizza and this simple piece of code becomes bigger and bigger. Later you will probably have to remove some types of pizza because they will not sell well. The application code clearly is not closed for such modification. And when it got really big it will be easy to introduce bugs. As learnt earlier in the book we should encapsulate parts which changes. At this point in the book simple factory “pattern” is presented. It is not a real pattern but it is a warm-up before the factory method is described. 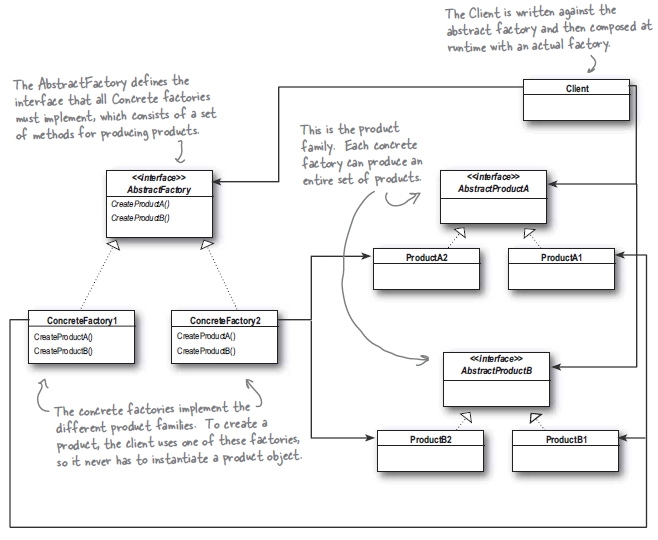 The Factory Method define an interface for creating an object, but let subclasses decide which class to instantiate. Factory Method lets a class defer instantion to the subclasses. In terms of factory method we usually mention creator classes and product classes. In the example from our book the creators are all subclasses of PizzaStore (ie. NewYorkPizzaStore) classes and products are different classes which extends from Pizza base class. Factory method helps our with sticking to another design principle: Dependency Inversion Principle. Without our factory method our PizzaStore was closely connected to all *Pizza classes (ie. NewYorkStyleCheesePizza). PizzaStore was depended on other pizza types. If we had changed anything in PizzaStore we did have to change all classes it was depended on. With implementation of abstract Pizza class PizzaStore is now depended only on Pizza. Finally, we have the prepared pizza in hand and the PizzaStore::orderPizza() method bakes, cuts and boxes the pizza. The Abstract Factory Pattern provides an interface for creating families of related or dependent objects without specifying their concrete classes. At the end of this chapter we are presented with really nice comparison of these two new patterns: Factory Method and Abstract Factory. We’re explained that their are really similar but shouldn’t be lump in with each other. We should use Abstract Factory whenever we have families of products we need to create and we want to make sure our clients create products that belong together. And we should use Factory Method to decouple our client code from concrete classes we need to instantiate, or if we don’t know ahead of time all the concrete classes we are going to need. Since the factory patterns creates instances of objects there are lots of examples on the Internet. Most of the first results in Google I get are rather hypothetical problems. Mostly those are results of pages where authors try to teach readers about the patterns. But one of them is really close to reality. It’s about creating images with factory method pattern. However, what comes to my mind there probably are many form builders which use factory patterns. In Wikia I recall nice example of code when we use factory to create social media widgets. I didn’t put many code snnipets in this post but you can download code examples of both: factory method and abstract factory.